The Business Times ran a rather interesting article today about renting versus buying. A study this year by Trulia in the United States found that home ownership is generally still 38% cheaper than renting. Meanwhile, the Reserve Bank of Australia said it could become cheaper to rent instead, with home prices unlikely to keep growing at the rate they have over the past 60 years. In Singapore, home prices have fallen faster than rentals since the TDSR kicked in. A research by Square Foot Research has found that if prices stay flat, or appreciate anything less than 2% over the next 4 – 5 years, renting could prove more cost-effective than buying a property. To illustrate the point, they used the example of a buyer who purchased a condo unit for $1.28 million in Upper Bukit Timah (District 21) and then sells the unit four years later – with four years being the minimum holding period to avoid paying seller stamp duty – at the same price. Taking the $1.28 million and subtracting the mortgage paid, remaining loan and initial downpayment and other miscellaneous fees, he would have made a loss of $149,000. On the other hand, the research shows that if he had rented the same unit for a monthly $2,800 for four years instead, he would have paid a total of $134,000 in rental – less than the loss he would have made from selling his home. The research also showed that buying the unit would still be more expensive than renting it, if home prices appreciate 1% in 4 – 5 years’ time. But the tipping point comes when prices increase 2% or more – buying becomes cheaper then. So given the current falling market prices, which is widely expected to worsen next year, does this mean homebuyers here should switch over to renting instead? Singapore, along with some other Asian countries, may be unique in that renting rarely comes across as an option for locals who can afford to buy – even if they bemoan the high cost. Their motivations go beyond mere profit-and-loss calculations, extending also to personal and psychological concerns – financial security or pride, for instance. Property prices also generally do appreciate in the long term, while rental money essentially goes nowhere, neither bringing one closer to owning a home nor yielding one any returns. It is merely “helping your landlord to pay his monthly mortgage”. Singapore’s housing policies are also more geared towards home ownership than leasing. CPF savings, for instance, are a powerful tool that helps locals to buy properties. 1. The amount of savings that one is able to derive from renting versus buying is largely a function of the price quantum and expectation of how much the market will fall. Using an example of a $2 million dollar property and if one thinks that prices will drop by 10% in a year, you can easily rent a more-than-decent apartment these days for $6K a month and still save in excess of $100K if you defer the purchase till next year. However, if the property that one is looking to buy is in the $1 million range, and assuming a price decline of only 5% in a year’s time, the resultant saving is only $20K even if one decides that he can make do with renting a lesser apartment at $2.5K a month meantime. So the question becomes: whether the actual savings is the worth the possible “opportunity costs”, which other than personal and psychological concerns, may also include timing, i.e. whether you can find the exact apartment that you wish to buy at that later point in time, which is especially so when comes to resale properties. 2. Although we may talk about a one year period of “rental then buy” versus “buy now”, this is also dependent on how soon one can find and purchase the “right” apartment and how long more before he can actually move it. As we have mentioned in our point #1, the process of finding the “right” apartment especially with resale properties is a matter of timing and also luck. So when one may be ready to buy, he may not be able to find anything that he likes at that point in time. Or he may be faced with more severe competition for that same unit because more people who had decided to enter the market then. And even if he manages to secure the unit, there is also the question of the time needed for legal completion and then renovation (the more extensive, the longer the time before one can move in). So effectively speaking, the wife and I reckon that for anyone who wants to wait a year by renting meantime, the effective rental period will more likely stretch to at least 18 months before he can move into his new (purchased) home. So one ought to take into account the extended rental period when doing their profit-and-loss consideration. What do you think? The wife and I really hope to hear some of your viewpoints as it has been awfully quiet on the "comment" front lately... so much so that we are beginning to wonder if there is actually anyone out there?! 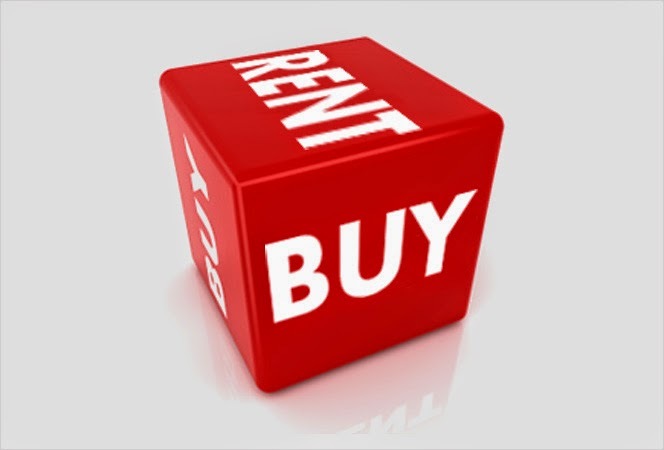 6 comments to ''Rent or Buy... THAT is the question!" might also be worth thinking about more in terms of range of outcomes as well. what is the value of living in a house that you can call home? i have read your blog since 2010 and is one of the first time waiting to buy, buyer. at the time when i read your blog, i don't have the means to buy. but now I'm equip with funds and is looking to buy. though report shows price are falling etc etc, but in actual fact it is still quite exp. don't u think? Hi Anonymous (12/11/2014, 2:50pm): First off, thank you very much for supporting our blog over the past 4 years! The wife and I are glad that you are finally in the market for your first home. While it is true that prices are still on the high side currently, resale prices have already dropped by about 5%. Even with new projects, developers are beginning to soften their stands on prices. However, there is a good chance that prices will ease even further next year as a deluge of new units are expected to come on-stream. And depending on who you ask, the magnitude of price decline can be anywhere between 10 - 20%. Having said that, the wife and I believe that there are still quite a bit of "pent up demand" within the market, i.e. people with the means to buy but just waiting for the market to soften even more before they enter. How this will affect the actual dynamics between demand and prices will be interesting to watch. Hope the above helps and good luck on your search! Thank you! :-) In case there's too many anonymous, i will leave a name for easy identification next time! Let me make some noise as per request. Current condo prices still on the high side even with those "barriers". When new , ard $450 psf. 12 yrs on , appreciated by 40%. Frankly , if it's 20% profit ,I can accept it as a capital appreciation. As we know new development prices are going down, so can take time to hunt for Good Buy. 10 years ago grad starting pay 2plus K, now 3plus K, how many percent increase?